UC Davis officials say they are trying to find out who posted flyers on campus that blamed Jews for the sexual assault allegations against Supreme Court Justice Brett Kavanaugh. A police investigation into their discovery comes amid reports that similar flyers were found at UC Berkeley and several other schools around the country. 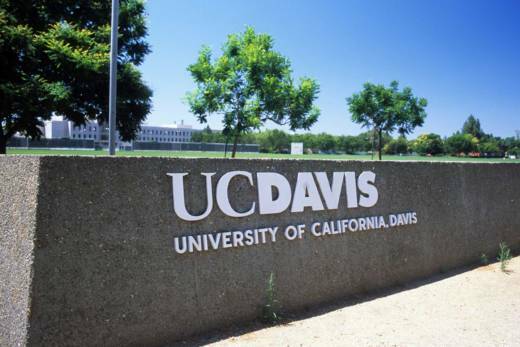 UC Davis Chancellor Gary S. May said the flyers were found on and near the campus on Monday. "The message on these flyers is reprehensible and does not represent who we are as a community," May wrote in a message to the Davis community. "To all of our students, faculty and staff please know I won't stand for intolerance of any kind," May said. He said the flyers were removed and campus officials were working to identify the people who posted them. Campus police are investigating, according to Melissa Lutz Blouin, a UC Davis spokeswoman. Oren Segal, the director of the Center for Extremism at the Anti-Defamation League, said on Twitter that the flyers were also posted at Vassar College in New York. The flyers read: "Every time some Anti-white, Anti-American, Anti-freedom event takes place, you look at it, and it's Jews behind it." They depict some Jewish members of the Senate and billionaire George Soros with Stars of David on their foreheads as well as Christine Blasey Ford and Michael Avenatti with the words "Good Goy" on their faces. Ford brought sexual assault allegations against Kavanaugh and testified before the Senate Judiciary Committee a week before Kavanaugh's appointment to the Supreme Court. Avenatti is a lawyer representing a woman who also accuses Kavanaugh of sexual misconduct. The Jewish Telegraphic Agency (JTA) is reporting that similar flyers were found at UC Berkeley. The news organization attributed the information to the group, Students for Israel, which said the flyers were found near Eshleman Hall. Representatives for Students for Israel did not respond to a request for comment. UC Berkeley spokesman Dan Mogulof said that campus officials were aware of the report. "But so far no one has come forward to report the details to UCPD (campus police) or campus administrators. And nor have there been reports of additional posters found on our campus," Mogulof said in an email. There's no evidence that someone affiliated with UC Berkeley left the hate-filled flyers on campus, according to Mogulof. "UC Berkeley abhors and condemns anti-Semitic words and deeds on this campus and beyond," Mogulof said. The Anti-Defamation League said it received reports of the flyers at UC Davis, in the area of the Berkeley campus as well as San Diego State University. The group says it confirmed that flyers were found at campuses in New York and Massachusetts. Cory Marshall, a spokeswoman for San Diego State, said the campus did not receive any reports of similar flyers. A Berkeley police spokesman, Officer Byron White, said he had not heard of any reports either. The flyer is attributed to a white supremacist, neo-Nazi website.